Between school struggles, therapies, and the challenges of "play dates," it can be hard to imagine your child with special needs taking part in after-school activities. The reality, though, is that the right after-school programs may be terrific opportunities for your child to show his strengths, build confidence, make friends, and discover new interests. Many kids with special needs also have impressive talents, regardless of learning disabilities, social issues, or speech delays they may be dealing with. But that doesn't mean she can't run like the wind, draw like Picasso, or be a successful Girl Scout. It's important to recognize and build these talents, especially when your child's challenges are so often the focus of discussion. Extracurricular activities can increase your child's opportunities to make friends and find a social niche. Many kids with special needs have social communication challenges. And let's face it: it's hard to make friends while you're in class, on the bus, or navigating the cafeteria. After-school activities are an opportunity to connect with other kids in a completely different way. Choose the right organization, and your child will suddenly have a built-in set of social connections. The skills your child learns after school can be as important (or more important) than the skills he learns in school. In school, your child is working on handwriting, standing in line, academic skills, appropriate classroom behavior. After school, your child may be learning to be part of a team, to support and encourage others, or to try new things. He may also be learning the rules of well-known games, earning respect, and building friendships. These are skills that will last a lifetime. After-school successes build confidence and respect. When your child hits a home run, plays piano at a recital, or earns a higher level belt in martial arts, both you and he get to see that he can succeed and even excel. Some after-school activities can become lifelong interests. If your child gets interested in music, art, sports, dance, chess, or any other cultural activity while in school, that interest can provide an outlet throughout her life. Be realistic. The fact that your child can kick a ball does not mean he is ready for a full-fledged soccer team. He may, however, be ready for something a little less challenging. Think carefully about what your child can really understand, do well, and focus on for a prolonged period. Both you and your child will suffer if you start something he can't finish. Keep sensory concerns in mind. Many special needs children are unusually sensitive to loud noise, heat, strong smells, and bright lights. If that describes your child, steer clear of activities that involve sensory "assaults." Consider special needs after-school programs. Some children with special needs thrive in "special" programs such as Challenger Club, while others would find such programs babyish or frustrating. If you're not sure, check out both the typical and the "special" versions of activities your child is likely to find interesting. Choose an activity in which your child is already interested. Kids with special needs may already cope with unpleasant therapies, challenging school expectations, school bullies, and worse. 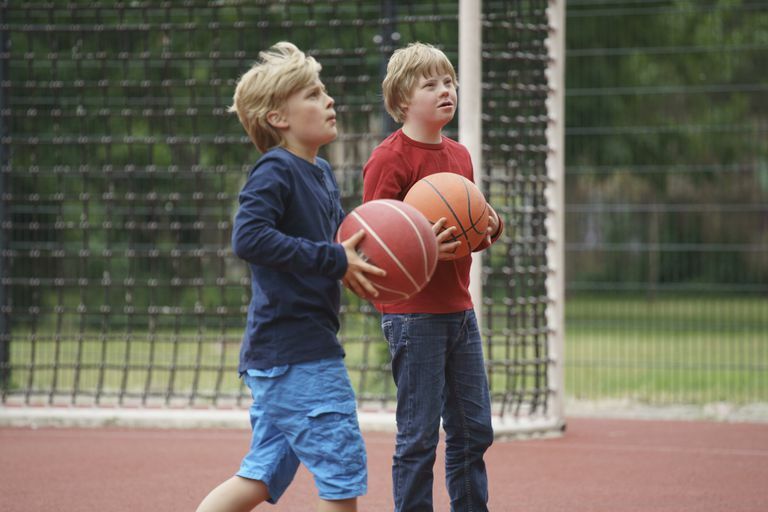 After-school activities should be something they actively enjoy. Select an activity your child is good at. Once your child leaves school, she deserves the chance to shine. Is she great at swimming? Is he terrific at drawing? Find your child an opportunity to show off what he can do well. Include your child in the decision, but be realistic. Your daughter may want to take a dance class, but she may not have the skills or discipline for the full-scale ballet program she knows about. Consider finding a lower key, more accepting dance program where she can be fully included even if her grande jete needs work. Consider structured programs as opposed to open-ended programs. Many children with special needs do much better in highly structured programs like Boy or Girl Scouts than in open-ended "exploration" experiences. Though the lack of structure appears more accepting, it can actually be extremely challenging to any child who doesn't already have solid physical, emotional, and organizational skills. Choose programs that have simple rules and little competition. Complex team sports (for example) demand high levels of physical, social, motor planning, and cognitive skills. The same is true of many competitive activities, from musical theater (auditions required) to dance team. Understand what your child is getting into. What is really expected of a child who joins the Boy Scouts or the recreational soccer league? If your child needs support, are they available? If your child runs into problems, how will the instructor or coach respond? Be sure your child is capable of doing what's expected (or has the necessary support if needed). Talk to the person or people running the program. Explain your child's strengths and challenges. How would the coach or instructor handle it if your child had difficulties or even had a meltdown? You'll probably walk away knowing if it's a good match. Consider becoming your child's shadow or aide for a while. In many cases, special needs children need help as they get started in an activity, but once they know the ropes they're just fine. If you have the time and ability, consider offering to be on the spot for your child for the first few weeks. Alternatively, hire a helpful "shadow" who can support your child and step in if a problem arises. This will lower everyone's anxiety and may make it possible for your child to become a full-fledged part of the organization. Don't neglect gender-bending or gender-free options. Sure, "most" boys are supposed to like sports and "most" girls enjoy dance. But kids with special needs may not know about, care about, or meet those stereotypes. If your son loves to dance or your daughter likes baseball, consider those possibilities. Remember that "after-school" can mean "in school" or "community-based." Sometimes the options available in the community (rec sports versus school sports, for example) are a better match for kids with special needs. Individual Sports: If your child enjoys sports, consider teams in which your child is performing on his own and competing with his own best outcomes. Options including swimming, martial arts, bowling, track and field, golf, archery, and many more. Structured Adult-led Clubs and Programs: Many children with special needs strive in programs such as Boy Scouts and Girl Scouts and 4H. That's because the programs are highly organized, children progress at their own rate, activities are hands-on, and the organizations themselves are dedicated to including children regardless of ability or background. Singing and Instrumental Programs: Instead of or in addition to music therapy, consider enrolling your child in a singing or instrumental program that actually teaches and celebrates skills. If your child can learn to sing, he will always be welcome in a chorus. If she can play an instrument, she can join the band. These are not only entries into school-based programs, but also hobbies to enjoy throughout life. Volunteer Activities: Most communities are loaded with opportunities for children (sometimes with parents) to volunteer their time. Kids can help clean up trash at the park, help foster kittens, visit nursing homes, or help raise money for school events by washing cars or selling treats. With parental involvement, they can become valued members of the community or school organizations. Theater: Many kids who have a tough time picking the right words and actions do very well when acting from a script. Acting clubs and camps require no audition and can be a great way to get started. Some kids with special needs discover they have a real talent for acting. Visual Arts: Many children with special needs are really quite talented in the visual arts. Schools and community art centers often offer after-school programs in drawing, painting, clay, and even multi-media art. Video and A/V: Quite a number of tweens and teens with special needs have great interest and skills in video and a/v. Many middle and high schools have video and A/V clubs, and many towns have local TV stations where kids can get involved. Even if your child isn't a creative videographer, she can find opportunities to be confident and valued behind the camera or managing microphones. Cosplay and Fantasy Games: Cosplay is short for "costume play," and it's becoming more and more popular. Both kids and adults make and wear elaborate costumes based on comic book or fantasy characters from TV or movies and attend "cons" (conventions) where they show off what they've created, get signatures from their favorite actors, compete in costume parades, and generally enjoy being geeks together. Fantasy games such as Dungeons and Dragons are also great ways for "geeky" kids to find like-minded friends who are eager to build and engage in fantasy world-building. Special Interest Clubs: Children with special needs are often fascinated by a particular area of interest and have a hard time getting interested in anything else. If this describes your child, consider helping her get involved with special interest clubs in areas ranging from mathematics and video gaming to animal welfare, Quidditch, or chess. Horseback Riding: Horseback riding can be expensive, but it combines a number of wonderful elements that may be perfect for your child. Equestrians learn to communicate effectively, build strength and balance, and gain skills in an exciting sport that can be individual, team-based, competitive or non-competitive. Ask about scholarships or special programs for kids with special needs. If you're the parent of a child with special needs you may feel "it's tough enough to get my child through the grocery store; why would I want to add another layer of difficulty to our lives?" If this describes you, remember that outside interests can change the course of your child's life (and, by extension, your life as well). The child who has an area of real strength, a group of friends and a sense of belonging can do great things. Now is your chance to get your child started on an interest that can last a lifetime.